You are here: Home / All Recipes / I hope you like mushrooms.. I hope you like mushrooms.. Mine was pretty decent…work went fast and there was less traffic on the road ( thank you Mr. Lincoln, Washington, and the rest of y’all.). I thoroughly enjoyed my almond butter/apple butter sandwich on Ezekiel bread at lunch. I had a good talk with mom on the drive home. It was a day off of running…thankfully, my legs needed the rest after 12 miles yesterday. I had my pajamas on by 7pm. Don’t judge me. I had a picture accepted on this website. And to top off this pretty awesome Monday…I had a big ole’ bowl of pasta for dinner. Pasta and pajamas…oh heavens! 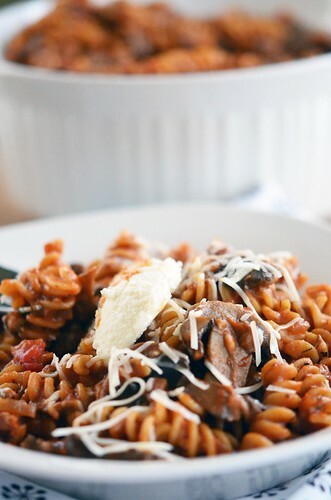 Whole wheat rotini with a mushroom ragu sprinkled with asiago cheese and a dollop of ricotta cheese. Yep. That so happened in my house last night. This dish…I don’t think it’ll make it to the freezer. It is too darn good. Well, at least I think it is awesome. (plus, pasta gets a bit mushy after being frozen). If you were my younger brother, sister-in-law, or my aunt…you would hate this dish. You would skip dinner and go straight to dessert. Why? Because they are mushroom haters… there are more mushrooms in this than they would ever be able to pick out. I have come to realize that people either love mushrooms or hate them. There is no gray area. Hate or love. And I love them. If you hate them, I am sorry…but you are missing out. Seriously. They are just so darn delicious. 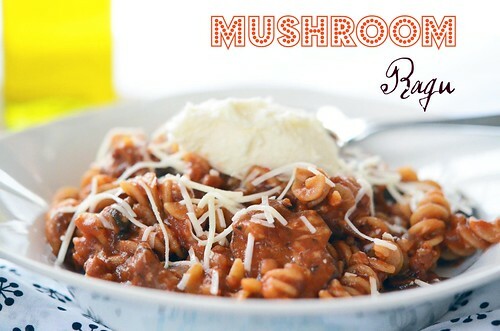 So, if you love them, make this…you will be in mushroom heaven. Place dried porcini mushrooms in 1 cup of boiling water for 15 minutes. Drain mushrooms through a wire sieve lined with a paper towel. Reserve mushroom water. Roughly chop re-hydrated mushrooms. In a large deep skillet, heat olive oil over medium/high heat. 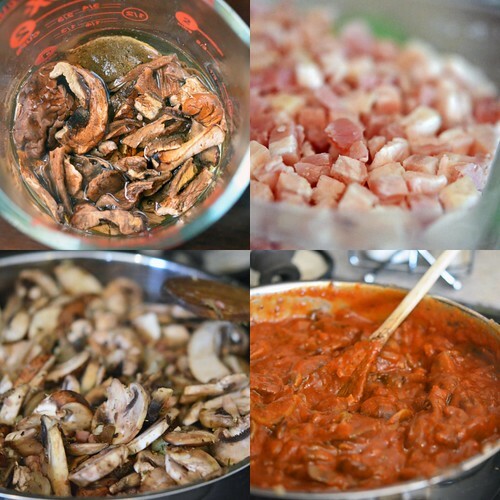 Once warm, place pancetta, shallots, and porcini mushrooms into skillet, Saute until shallots have softened (about 5-8 minutes). Stir often. If anything starts to brown too quickly, just reduce the heat a bit. Add remaining mushrooms (baby portobello and white), minced garlic, red pepper flakes, oregano, and thyme. Saute for about 8 to 10 minutes until the mushrooms have browned and are tender – you will want to stir/toss often. Once the mushrooms have browned (and reduced in volume), add the reserved mushroom water and bring to a boil. Boil until all the water is evaporated ( about 10 to 15 minutes). Stir in marinara sauce and bring to a simmer. Simmer for about 5-10 minutes. Salt and pepper to taste. Meanwhile, bring a large pot of salted water to a boil. Pour dried pasta into boiling water and cook until al dente – about 8 minutes. Drain pasta. 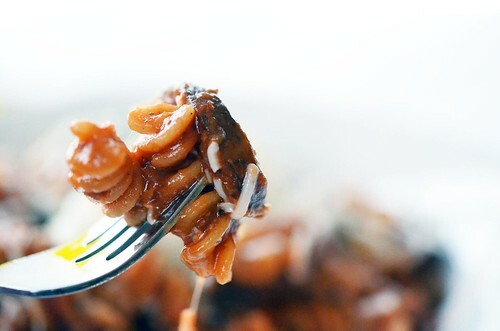 Toss pasta with mushroom ragu and mix in 1/2 cup of asiago cheese. Serve. Top each serving with extra asaigo cheese and a dollop of ricotta cheese. This tastes delicious the day after as well!